These are great as an appy and the batter can be made a few hours before needed and then fried to order. You will need a food processor for this one as there is simply no way to get it smooth enough without one. Be careful when you add the bread though- I fried my last food pro by adding the bread crumbs too quickly and it gummed the whole damn thing up, complete with smoking motor! Blend all in food pro (except extra chili sauce for dipping) until well mixed but not smooth. 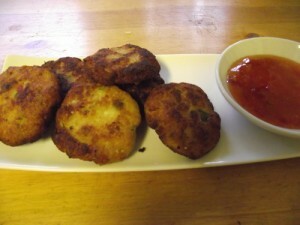 Shape the dough into small patties and shallow fry on med/high until golden brown. Serve hot with chili dipping sauce.